It’s ok to be self serving. It’s a pretty freeing concept once you decide to take the plunge. When it comes to beer, you should be in control what you want to try, how much you want, and when you want to drink it. By being self serving, you control all these aspects. Once you start, it will be hard to go back to any other way of drinking. The concept is pretty straightforward: you hand over your credit card (much like opening a tab), get a card with a chip that keeps track of how much beer you’ve poured, and then make your way over to the wall of taps to see what looks appealing. Screens above the taps list what’s being poured at each one, and you can touch the screen to reveal a description of the beer, ABV, and price per ounce. You can pour as much or as little as you like. There are glass rinsing stations on each end of the set of taps so you can refresh your glass between beers or beer styles. As you pour, you can see how many ounces you’ve got and the cost for that beer, along with your total. After 32 ounces you’re cut off until you check in with a host, a measure to prevent over serving inebriated patrons. 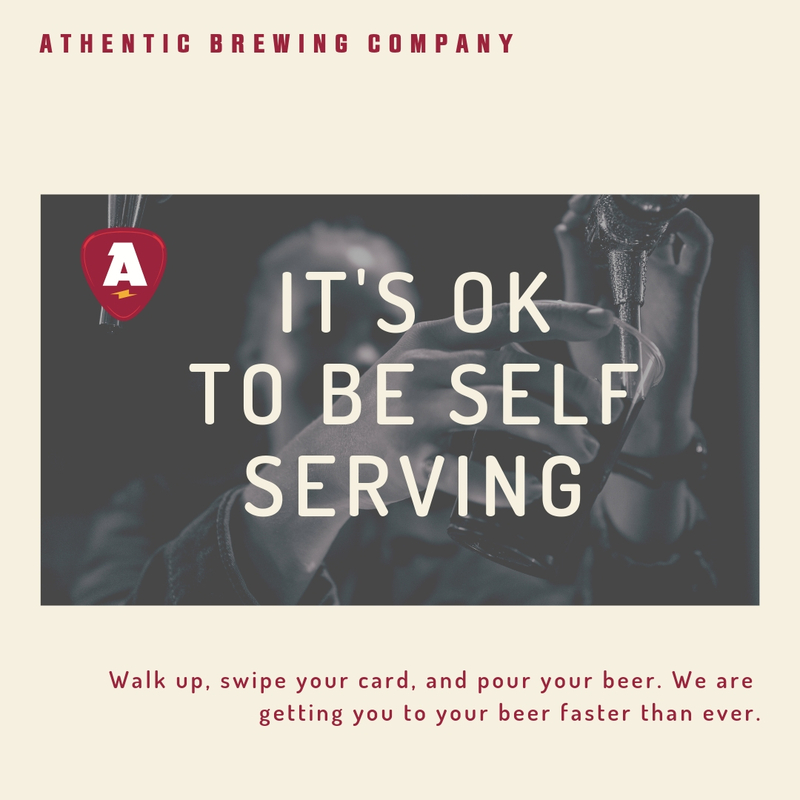 At Athentic Brewing Company, we also have another method called the “Athentic Alliance.” This is a free membership club that allows you to have a permanent card that is registered to your account. This allows you to pre load the card with any amount of money and use it at the beer wall and for merchandise in the store. Membership also allows you to skip the line when you walk in and go straight to the ID check station. Members receive additional perks such as member only events, discounts on ticketed events and merchandise, and more. To learn more about the card, you can go here. And, if you are afraid of missing the interaction with the bartender- don’t worry. There are Beer Ambassadors present that are available to talk beer with you and help you find the right beer for your tastes and mood. They are also available to help you with the pouring, the transactions, and any problems that might occur since they won’t be trying to pour perfect pints at the same time. Pouring your own beer is pretty fun. The golden liquid pouring down the side of a glass is one of the prettiest things someone can see. Not having to wait in stacked lines hoping to be noticed by a bartender is a thing of beauty.